Borrowing from the same technology that allows modern bipedal robots to walk, researchers from the University of Texas at Dallas have developed powered prosthetics that allow amputees to walk on a moving treadmill almost as fast as an able-bodied person. Bipedal humanoid robots are capable of walking, running, jumping, and climbing stairs autonomously. But the same can't really be said about modern prosthetics, which limit similar actions in humans; they fail to mimic the power generated from human muscles. Powered prosthetics exist, but they lack the "intelligence" to stably respond to disturbances or changing terrain. To overcome this limitation, a team from UT Dallas researchers meticulously studied the human gait cycle, and then used mathematical theorems to simplify it down to a single variable. "If you measure that variable, you know exactly where you are in the gait cycle and exactly what you should be doing," noted lead researchers Robert Gregg in a statement. The result was a unified control model similar to the ones used to control the fluid motions of modern bipedal robots. "We borrowed from robot control theory to create a simple, effective new way to analyze the human gait cycle," said Gregg. "Our approach resulted in a method for controlling powered prostheses for amputees to help them move in a more stable, natural way than current prostheses." For it to work, sensors measure the center of pressure on a powered prosthesis. Sophisticated algorithms consider the height, weight, and dimension of the residual thigh. During testing, wearers walked on the ground and on a treadmill moving at increasing speeds. 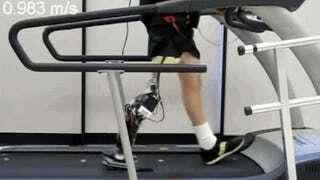 "We did not tell the prosthesis that the treadmill speed was increasing," noted Gregg. "The prosthesis responded naturally just as the biological leg would do." Participants were able to move at speeds of more than a meter per second (3.2 feet/s), which is an excellent result when you consider that average walking speed for an able-bodied person is 1.3 meters per second (4.2 feet/s). They also said they didn't have to exert as much energy compared to traditional prosthesis. The results of this research can be found here. Images and video via UT Dallas.